This article explains what each field is and does under the Settings 1 tab in system setup. Within the Printing section, enable Use PDF Writer if you wish to email your invoices and reports (as PDF files). You will also need to select your PDF printer from the corresponding dropdown. You can also enable a Receipt Printer here; you will need to select it from the dropdown provided. Within the Display section, set if you want to completely hide the main Storman Dashboard, hide or show the Facility Map, hide or show the Key Rent data on the Storman Dashboard and whether you wish to display Ad-hoc Credit Sales on the Customers section on the main Storman Dashboard. 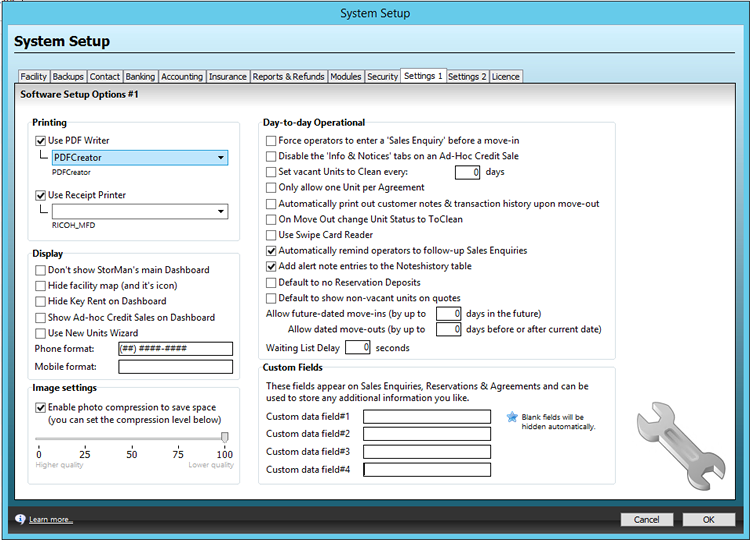 Enabling the Use New Units Wizard setting tells Storman to use the wizard when adding a new Unit to a Customer's Agreement (as opposed to the classic multi-step method). The Phone format and Mobile format fields are used to configure how phone numbers will be displayed on Sales Enquiries, Reservations, Agreements & Other Credit Sales. In the Image settings area, enable Photo compression if you wish to save space in your datafile. This is generally only relevant if you store photos on Agreements. You will then need to set your compression level - 100% for the most compression (which will result in smaller, but low quality photo files) right up to 0% for no compression (which will result in large, but high quality photo files). The Day-to-day Operational section provides many options; many of which are self explanatory. Fields of note include whether you use a Credit Card swiper to input credit card details (as opposed to manually typing them in) and whether you wish to automatically remind staff to follow-up Sales Enquiries. You can also set the maximum number of days for future-dated move-ins and future-dated move-outs. The Waiting List Delay field lets you specify the number of seconds to wait between closing an Agreement and displaying the Waiting List, where the recently-closed Agreement featured a Unit type that another Customer (on the Waiting List) is waiting for. Custom Fields allows you to specify up to 4 additional fields for collecting data from Customers. These fields appear on Agreements, Reservations, Sales Enquiries & Other Credit Sales. Fields left blank are automatically hidden.